This problem likely starts from childhood. Scientists believe that the taste of sweet is the first taste that children desire. This is in part due to the feel-good brain chemicals released when we consume carbohydrates. So how do we curb this addiction created from childhood? Many times, this starts by choosing healthy catering options over the sugary competition. While you may never lose the craving entirely, there are steps you can take to decrease the intensity of your sugary cravings. This is much more a mental game than a physical game. People must make a conscious decision to avoid sugar for good rather than viewing this as a temporary sacrifice to make until they reach their dream goal. If you commit to avoiding sugary foods all together, you should stop craving these foods in about ten days to two weeks. However, in order for this tactic to work in this time frame, these foods must be eliminated from your diet completely. In a corporate setting, it may work better for you as well as those around you to seek out a catering service without any sugar. Whether you are looking for a healthy catered lunch or breakfast, this simple step can help you curb sugar cravings quickly. By keeping the sugar out of the office, you are less likely to desire it throughout the day. 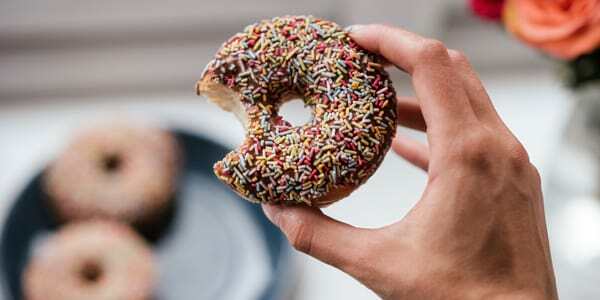 In addition to simply keeping these sweets out of the office, home, and most importantly, your stomach, there are other ways to curb these cravings. Many times, when you are craving a certain food, your body is actually craving something else. By discovering healthy alternatives to the foods you are craving, you will be more likely to choose a healthy option over cake in the future. Fruit - much like cake, fruits are high in sugar. Unlike cake, the sugars found in fruits are healthy and natural. Also unlike cake, fruit has addition vitamins and benefits for your body. Dark Chocolate - If you absolutely cannot get over your chocolate craving, choose dark chocolate over milk chocolate. Dark chocolate has healthy plant compounds and other benefits. However, this treat is still high in sugar, so it is important to limit the amount you eat. If you struggle from sugar addiction, you are not alone. You are also not without hope. By choosing healthier options you can curb this addiction and embrace a life without sugar that can be just as delicious as ever. In case you are looking for healthier options for your party, our chefs will be more than happy to make healthier options for the event.